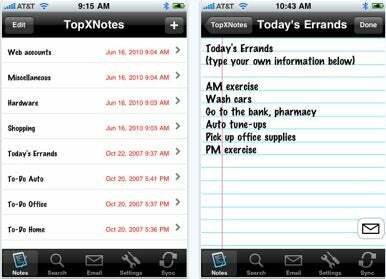 When it comes to Mac-based note-takers, TopXNotes has proven itself to be a fine personal notes manager for keeping track of all your to-dos, lists, directions, receipts, and so on. Tropical Software is looking to take that note-management expertise on the road with an iPhone version of TopXNotes that hit the App Store earlier this month. Along with letting you create, edit, and delete notes on your iPhone, iPod touch, or iPad (though not in native form), the mobile TopXNotes wirelessly syncs with its Mac counterpart. The TopXNotes mobile interface is a simplified iteration of what you find in the Mac version, presenting you with a straight-forward list of your notes. From there you can create, edit, and delete notes in landscape or portrait mode, or e-mail notes from within the app. TopXNotes Touch syncs to your Mac via your home Wi-Fi network, so those looking for a cloud-based solution for note syncing needn’t look here. TopXNotes also includes a nifty backup and restore feature, letting you back-up and restore any notes directly from your device. This could come in handy if you were to accidentally delete a crucial note while away from your Mac. TopXNotes Touch runs on OS 3.1.3 or later and costs $1.